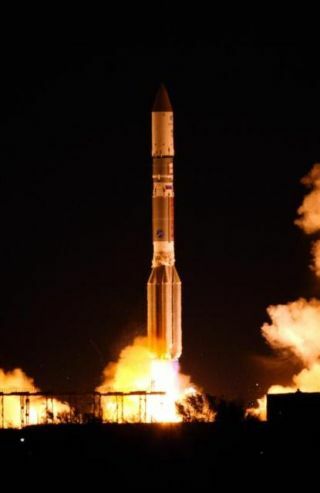 PARIS — An International Launch Services (ILS) Proton Breeze-M rocket on Wednesday (May 15) successfully placed the Eutelsat 3D Ku- and Ka-band telecommunications satellite into transfer orbit in the third of a planned six monthly commercial ILS launches scheduled through August. Eutelsat announced immediately after the launch that it had signed another contract with Reston, Va.-based ILS, for an unnamed satellite to be orbited between 2014 and 2016. Eutelsat has six satellites under construction and scheduled for launch by late 2015. Eutelsat 3D will have a Ku-band beam trained on sub-Saharan Africa, another covering Europe, the Middle East and parts of Central and South Asia, and a Ka-band beam covering most of Europe, Russia and the Middle East. Operating from Russia’s Baikonur Cosmodrome in Kazakhstan, the Russian Proton Breeze-M vehicle separated the Eutelsat 3D after a mission lasting nine hours and 13 minutes and including five ignition sequences of the Breeze-M upper stage. ILS President Philip R. Slack, who watched the launch from Eutelsat’s headquarters here, said the company is on track to launch six commercial satellites by August as it returns to flight following a Proton launch anomaly in December. The Eutelsat launch was the third of these six missions, following launches of the Satmex 8 satellite in March and the Telesat Anik G1 in April. Next up is the SES-6 satellite, owned by SES of Luxembourg, which is scheduled for June, Slack said. SES-6 has already arrived at the Baikonur spaceport. Speaking with journalists after the liftoff, Slack said it will take several more weeks before ILS and its owner, Khrunichev State Research and Production Space Center of Moscow, which is owned by the Russian government and is Proton’s principal manufacturer, to determine the Proton launch manifest after August. The Russian government is a regular customer for Proton rockets, and the Proton schedule between September and December will depend in part on what satellites are ready, Slack said. Eutelsat 3D will operate at 3 degrees east in geostationary orbit for about a year. Following the successful launch of the Eutelsat 3B satellite in 2014, Eutelsat 3D will be moved to 7 degrees east, Eutelsat Chief Executive Michel de Rosen said during a presentation to the audience gathered to watch the launch here. The audience included representatives from the governments of Bolivia and Peru, a signal that Eutelsat, like several other North American and European satellite fleet operators, is eyeing Latin America for part of the company’s future growth plans. Eutelsat has won rights to an orbital slot over Brazil but has not announced its plans there.